A squint, or strabismus, is a condition affecting many people. It is normally first seen in childhood and causes the eye to appear to turn inwards. It usually affects only one eye but can be seen in both occasionally. The focusing ability of the eyes is controlled by many tiny muscles that support the eye. If a person has a squint, these muscles can allow the eye to turn inwards causing the person to be less able to focus properly. It can be corrected using a variety of methods such as the use of glasses, eye drops, eye patches or even surgery. There are several possible causes of a squint. Sometimes it is present at birth and has occurred during foetal development. Often childhood illnesses such as measles or chicken pox can be to blame, or it may simply be due to the development of the eye muscles. Some spectacles have been designed in order to help the person focus better. The lenses are designed for each individual and can allow the weakened muscles to gradually improve in strength. Eye drops may be administered to the more effectively functioning eye forcing the muscles around the weaker eye to work harder to focus. 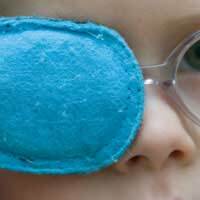 Eye patches are often used as a way of allowing the muscles of the weaker eye to strengthen over time and will then be able to focus more effectively. Most surgical corrections of a squint can be performed as a day patient and an overnight stay is not normally required unless there are complications during the procedure, or the person has a problematic medical history that may lead to complications. Before surgery the eye will be examined and the procedure should be discussed at length so the patient or carer is fully informed of what to expect both during and after the operation. Vision will be assessed and the eye measured in order for the surgeon to have a good idea of how the procedure can be tailored to your needs. Due to the nature of the surgery, a general anaesthetic will be required, so the patient must remain nil by mouth for at least 6 hours prior to the surgery.The anaesthetist will discuss the anaesthetic before surgery and answer any questions that may arise. Often, local anaesthetic eye drops are administered in order for the eye to remain paralysed during the operation allowing for the surgery to be performed more effectively.During the operation, the surgeon will either strengthen the weakened muscle or weaken other muscles in order for the eye to appear straight. As with all anaesthetics, there is a chance that some nausea and vomiting may be experienced. Medications can be provided to lessen the risk or treat if needed.The patient will normally have some protective coverings over the treated eye, which aim to reduce the incidence of infection and allow the eye to rest and heal. Any stitches that have been used during the operation will be dissolvable and will not necessitate removal. Occasionally one of these sutures may remain in place for a while allowing for adjustment of the tensile strength of the material. Often the use of eye drops will be needed for a short period following surgery.As this surgery aims to simply straighten the eye, glasses may still be needed as normal vision will not have been restored if previously abnormal prior to surgery. Squint repair does not always involve the use of surgery and will often only be used after other methods have been proven to be unaffected. It is not intended that surgery will improve the visual ability of the eye, but will enable it to appear straightened which in turn may help the individual focus more effectively. if any lances of squent eye.pls. tell me. bcz. lot of problem my life on squent eye.